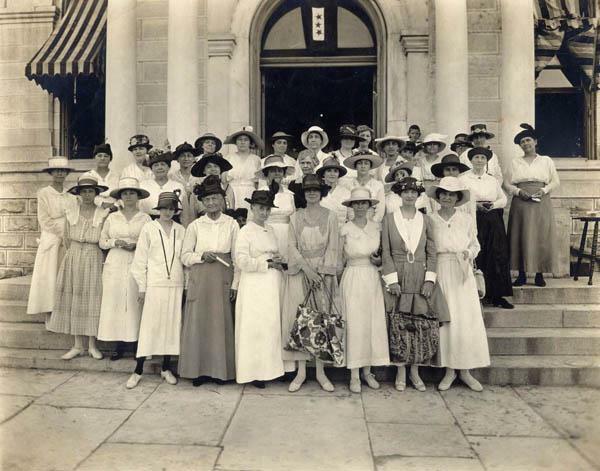 The League of Women Voters of Texas (LWVTX), a nonpartisan political organization, was formed on October 19, 1919, at San Antonio, when the Texas Equal Suffrage Association was dissolved to reorganize for a new purpose. Earlier the same year Carrie Chapman Catt, head of the National American Woman Suffrage Association, had urged the formation of the League of Women Voters as the successor to NAWSA and as the official support organization for newly enfranchised American women. Under the forceful leadership of its first president, Jessie Daniel Ames of Georgetown, who served from 1919 to 1923, the LWVTX focused its efforts on educating the newly enfranchised women voters of the state. To this end it published a monthly newspaper, the New Citizen. In early years the group urged women to pay poll taxes, conducted citizenship schools, held "Get Out the Vote" campaigns, issued a "Voter's Calendar," queried political candidates and published the results, and printed a booklet entitled Know Your County. The League was active in the Joint Legislative Council, a consortium that lobbied for women's welfare, and in the 1920s it lobbied for legislation to establish a minimum wage for women, provide maternity and infant care, prohibit child labor, allow jury service for women, reform the state prison system, improve rural education, and give women equal representation in delegations to national party conventions. Notable officers during the early years included Helen E. Moore of Texas City, Alice Merchant of El Paso, Jane Y. McCallum of Austin, Mrs. D. W. Kempner of Galveston, and Mrs. Harris Masterson of Houston. As a nonpartisan organization, the LWVTX did not endorse or oppose candidates or political parties; it studied political issues and issued position papers. After tenaciously working for more than eight years, in 1949 the organization secured legislation ensuring a secret ballot for Texans. The group also labored for a constitutional amendment, which finally passed in 1954, enabling Texas women to serve on juries. In the late 1940s and early 1950s the LWVTX supported the establishment of a system of family courts in Texas, urged elimination of legal discrimination against women based on marital status, and compiled a comprehensive "Know Your State" survey that became the highly acclaimed textbook Texas Constitutional Review. In later years the league gave sustained attention to the need for a revised state constitution, studied the selection and tenure process for appellate judges, and worked toward the abolition of the poll tax and the establishment of a permanent voter-registration system. It also analyzed relationships among federal, state, and local governments, especially cases in which the state relied on the federal government to solve urban problems. From its origin the LWVTX has remained a member-directed organization. The state board, which establishes policy, is elected at biennial conventions, where the organization's budget and programs are also approved. Membership became racially integrated and reached a peak of 5,000 in the mid-1950s; it stabilized at about 4,100 in thirty-seven local leagues by the late 1980s. The LWVTX, like other state arms of the League, is affiliated to the national organization through some shared finances and common goals and structure but establishes its own program. The league publishes the Voters Guide to inform voters of the qualifications of candidates in statewide elections and sponsors televised debates between gubernatorial candidates. In 1986 it published the Texas Government Handbook for use in secondary schools and colleges. The permanent offices of the LWVTX are located in Austin, and its records are deposited in the Southwest Collection, Texas Tech University. Bibliography Mrs. D. R. Bowles et al., comps., History: Texas League of Women Voters, 1903 to 1940 (MS, Jane Y. McCallum Papers, Austin History Center). Dorothy Brown, Sixty-five, Going on Fifty: A History of the League of Women Voters in Texas, 1903-1969 (MS, League of Women Voters of Texas Files, Austin, 1969). Texas League of Women Voters, October 10, 1919-December 6, 1923 (MS, Texas State Archives, Austin. League of Women Voters is not to dissolve any present organization but to unite all existing organizations of women who believe in its principles. It is not to lure women from partisanship but to combine them in an effort for legislation which will protect coming movements, which we cannot even foretell, from suffering the untoward conditions which have hindered for so long the coming of equal suffrage. Are the women of the United States big enough to see their opportunity? Barbara Stuhler Media Library Excellent videos, audio, photos and news concerning US political events. Great fun to explore!